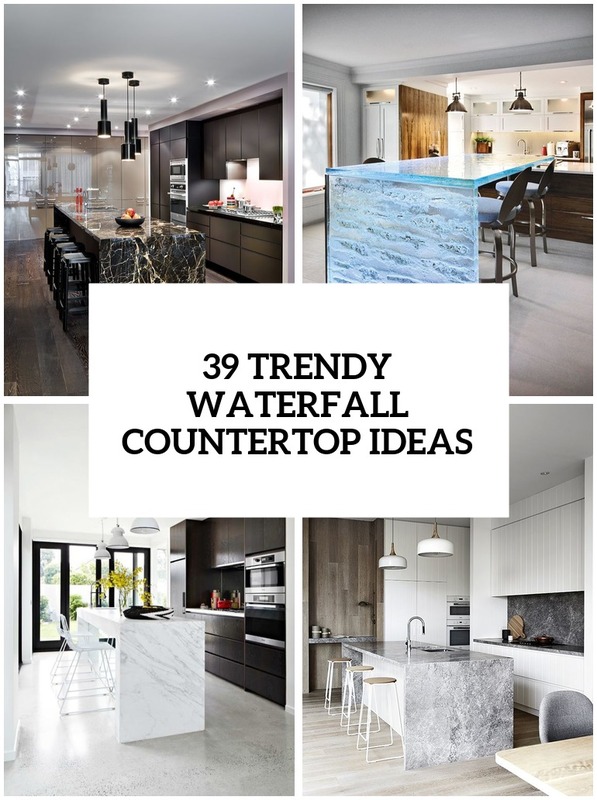 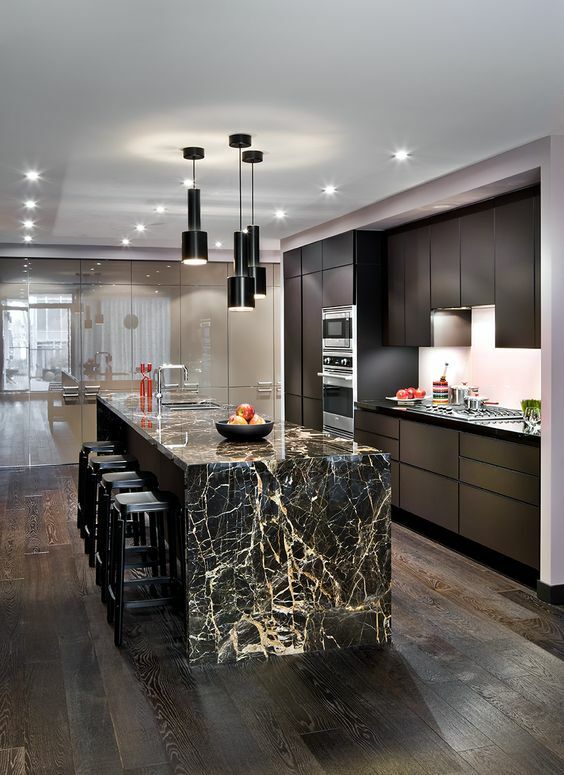 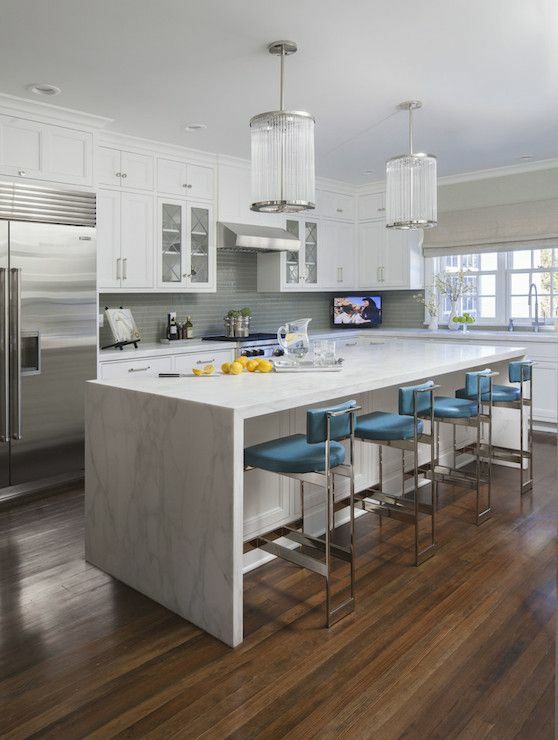 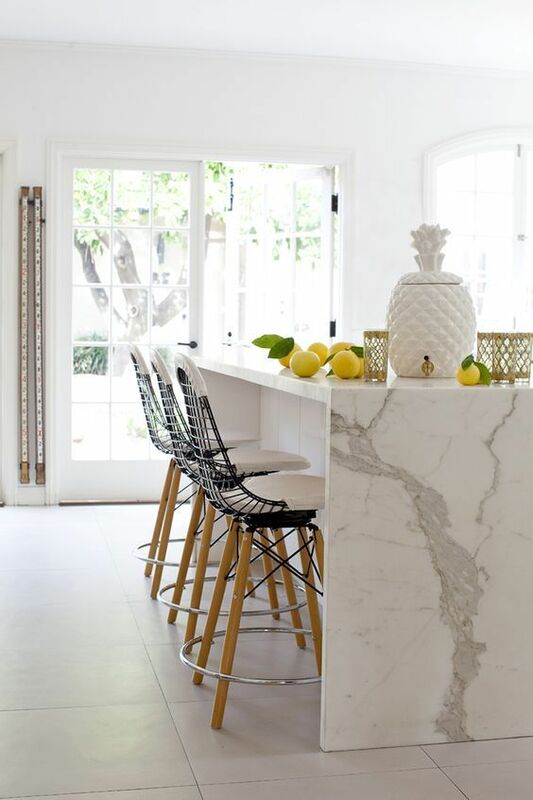 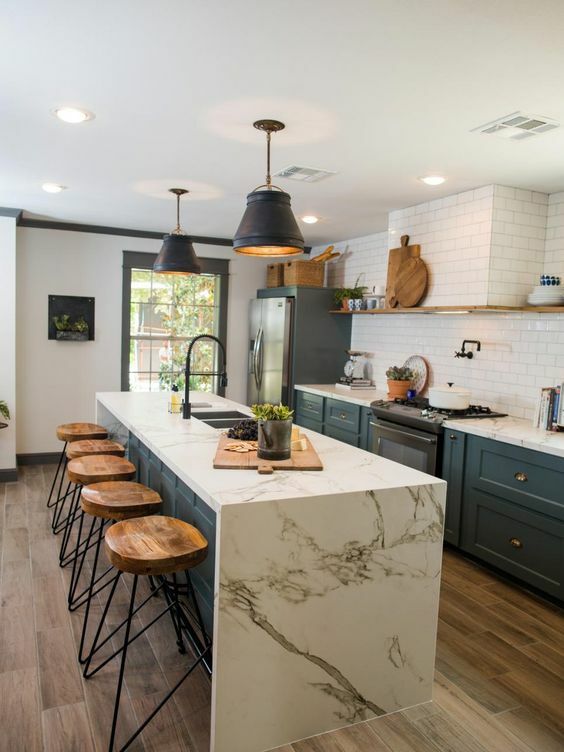 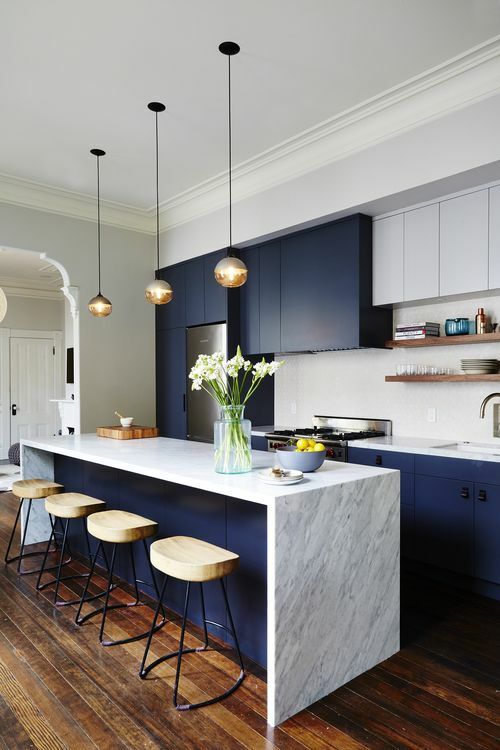 Waterfall kitchen countertops are a trend that is here to stay. 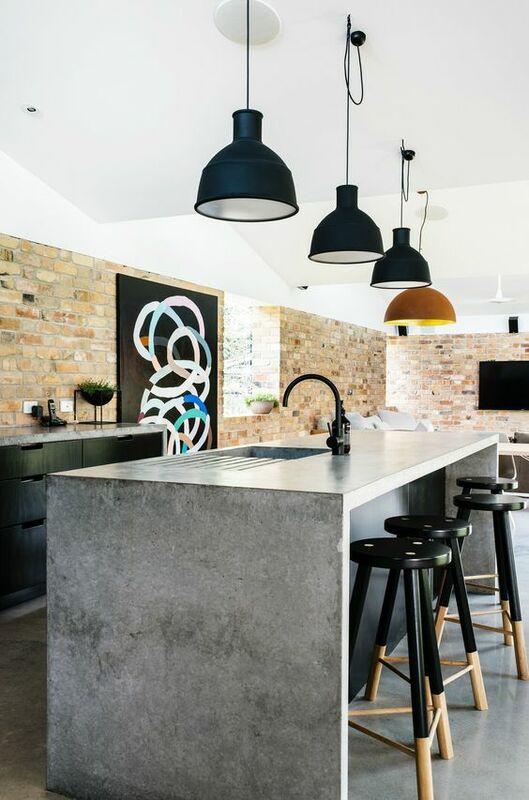 They fit modern, vintage, Scandinavian and lots of other kitchen styles adding a refined touch to any of them. 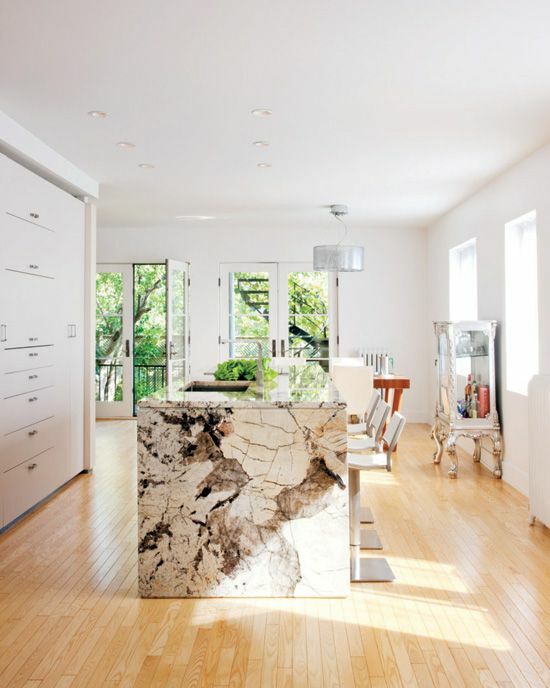 Granite, concrete, quartz, glass, wood – there are a lot of ideas to try. 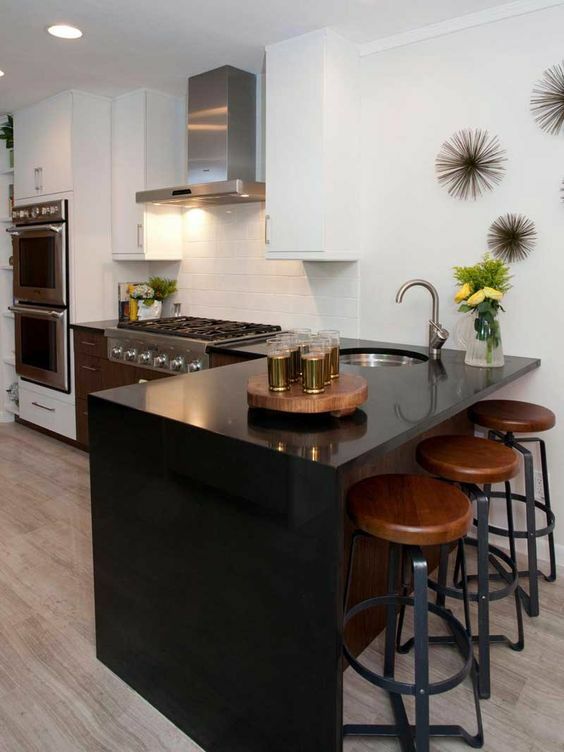 But this isn’t the only reason for choosing such countertops for your kitchen, I can give you much more! 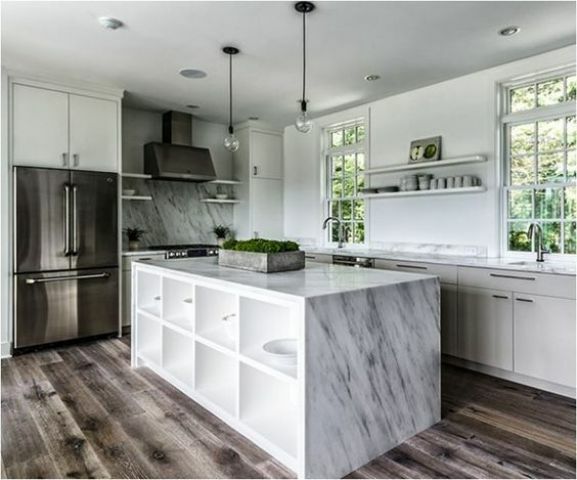 A waterfall countertop perfectly hides appliances and various stuff stored, it gives your kitchen island a cool clean and uncluttered look. 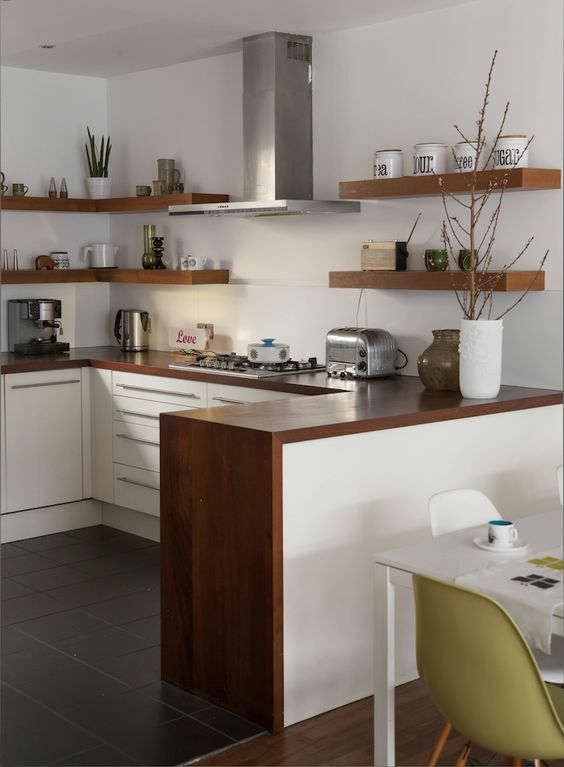 It features a frame over the cabinetry making the space tidy, that’s essential for open layouts. 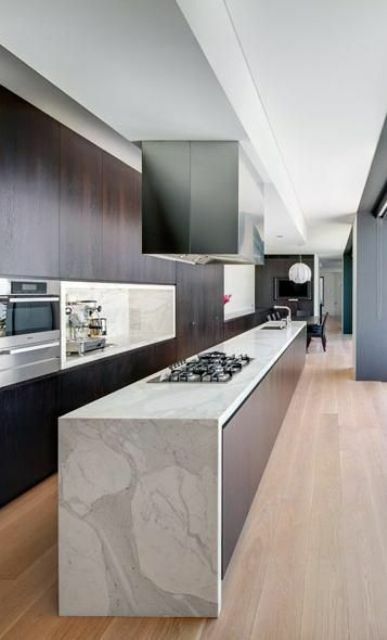 One more advantage is durability: usual end panels are often scratched by pets, kids and clumsy adults but this won’t happen with waterfall tops. 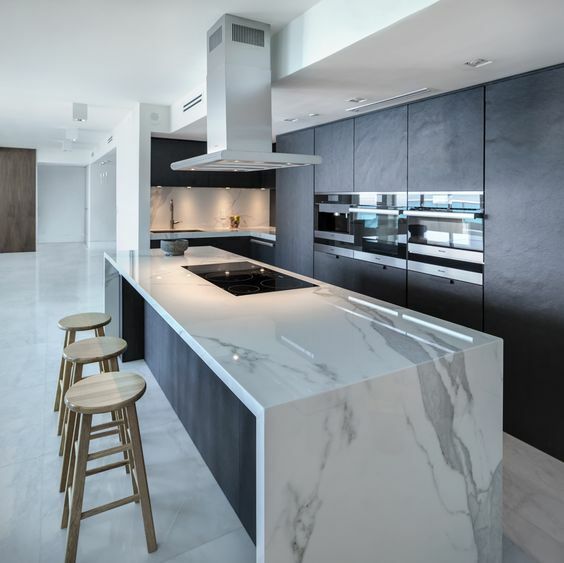 Just choose a durable material like granite or quartz and you won’t remember about this problem. 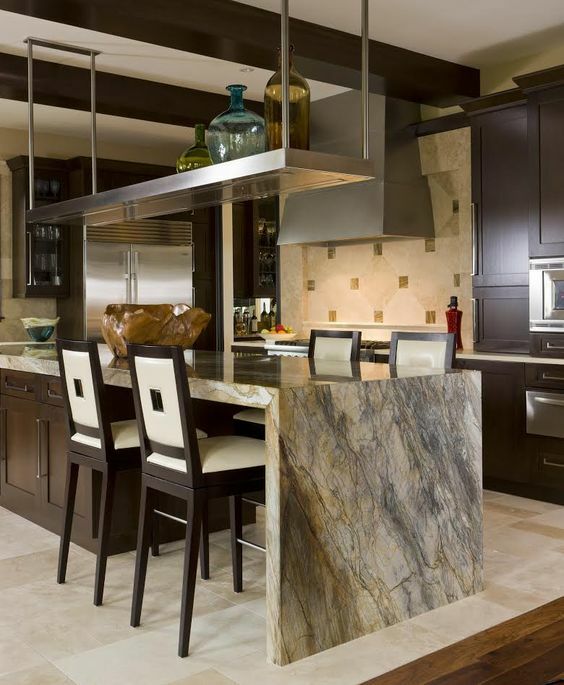 A waterfall countertop is a great way to show off the perfect exotic or unique natural stone that you’ve chosen for décor. 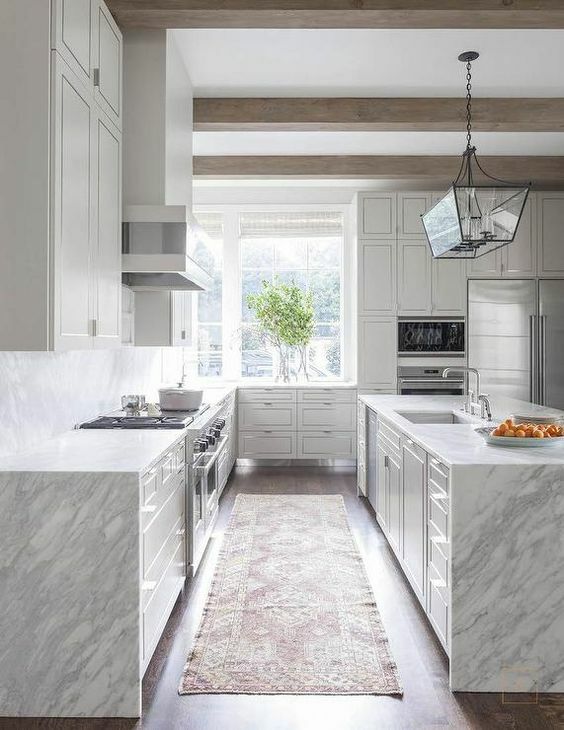 Choose an open floor plan to make the countertop visible from other rooms, it will be a focal point of your kitchen and a touch of luxury. 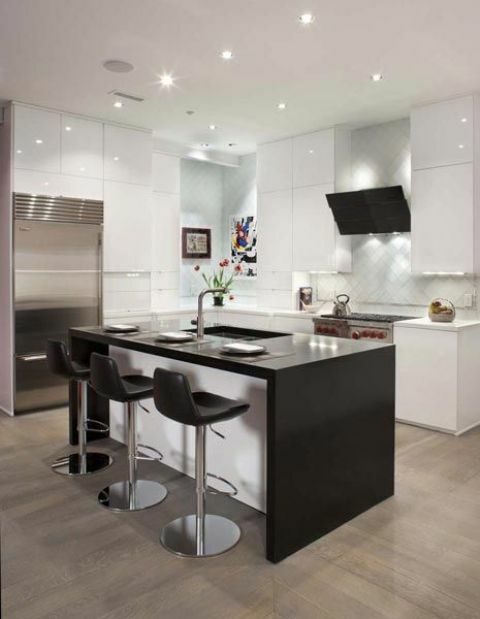 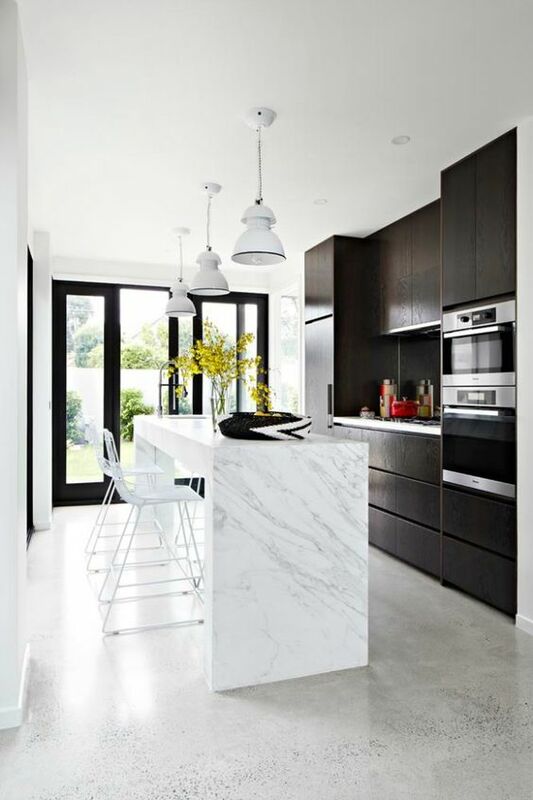 If you have a modern kitchen, clean lines and angles should be emphasized. 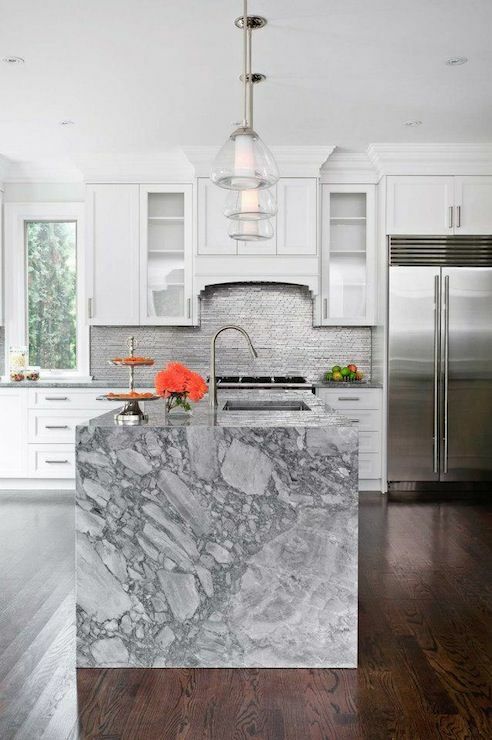 A waterfall countertop will have a strong 90 degree angle on both sides and it will add symmetry and a cool statement to your kitchen. 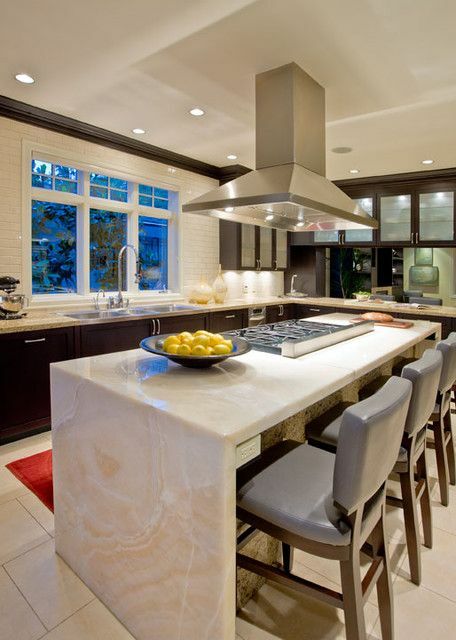 You can choose from glass, various kinds of stone and wood to complete your kitchen look and highlight the décor. 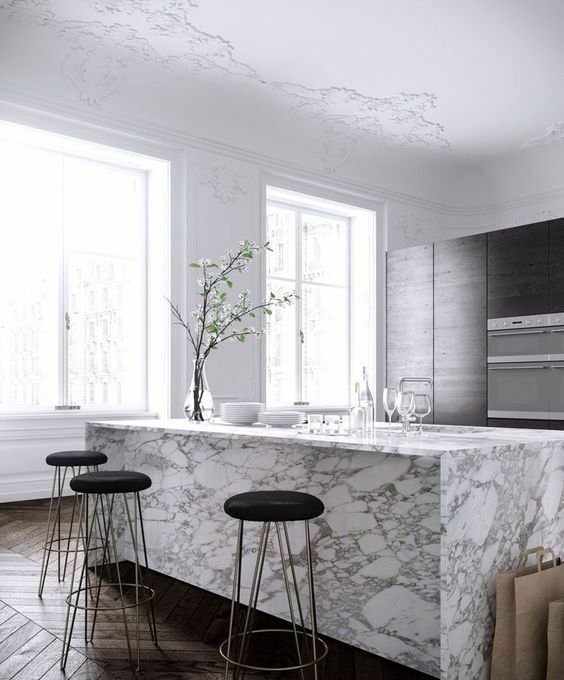 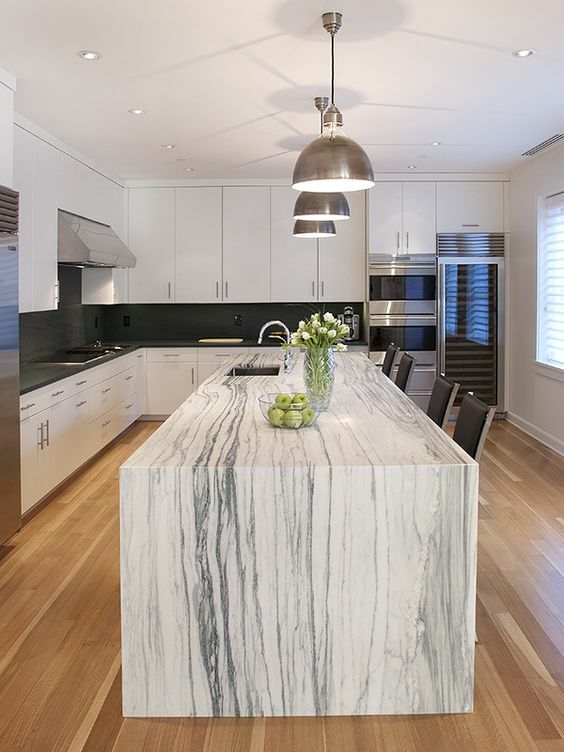 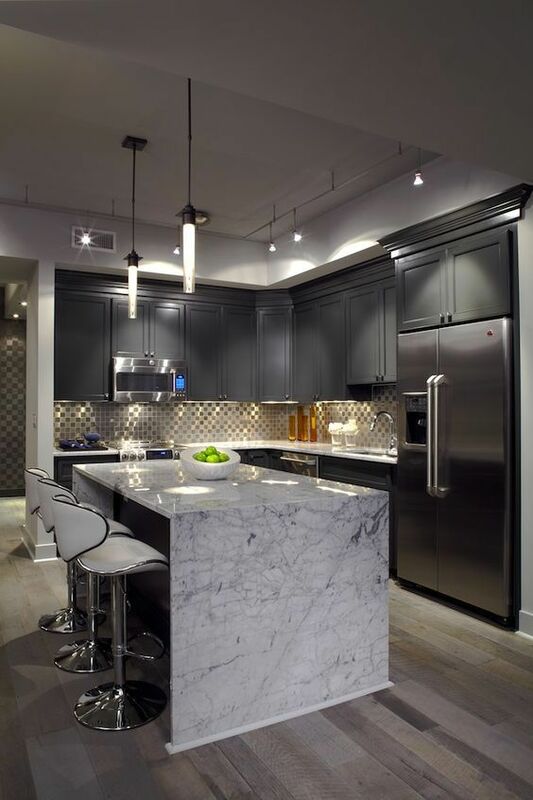 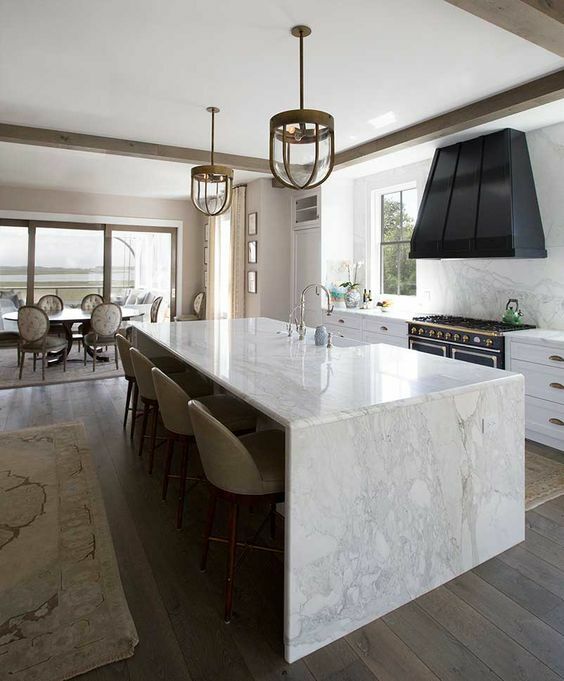 Granite, marble and quartz countertops add appeal to the wooden cabinets and make them look cleaner and more edgy. 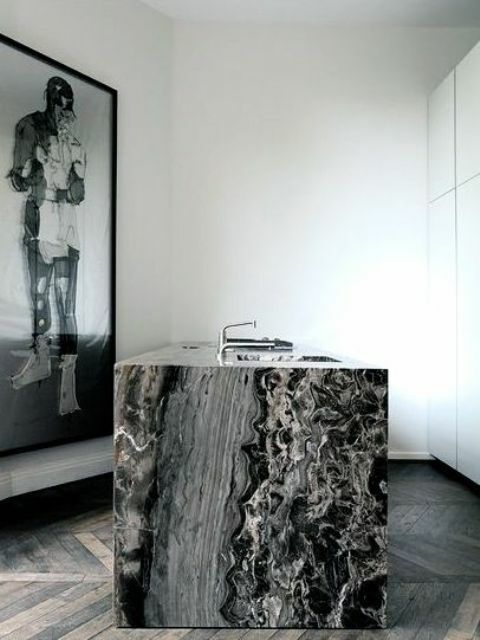 And of course, showing off the texture and veining of your stone slab is a cool idea. 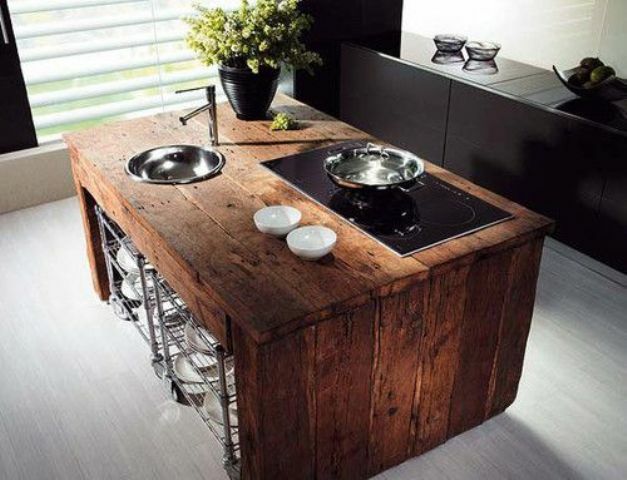 Reclaimed and weathered wood give your kitchen a raw and rustic flair. 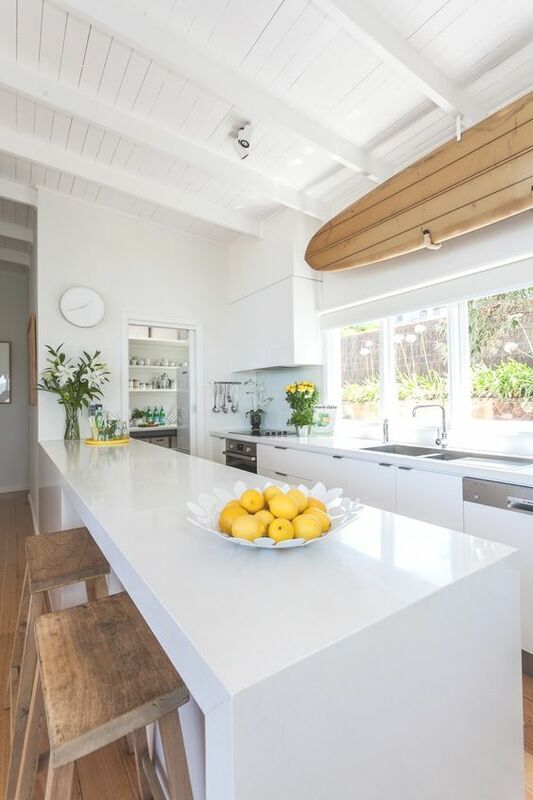 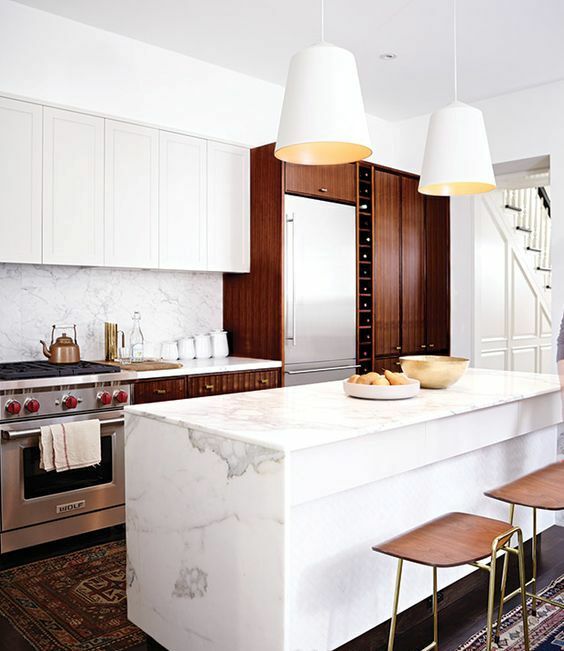 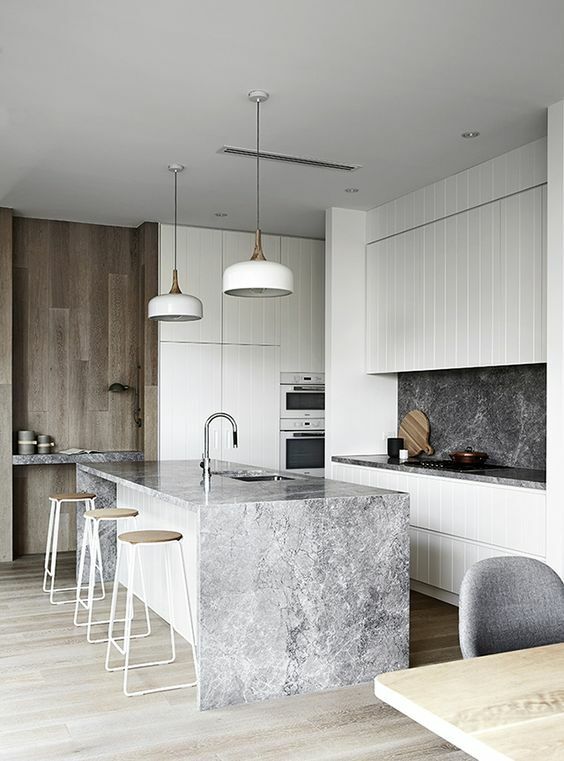 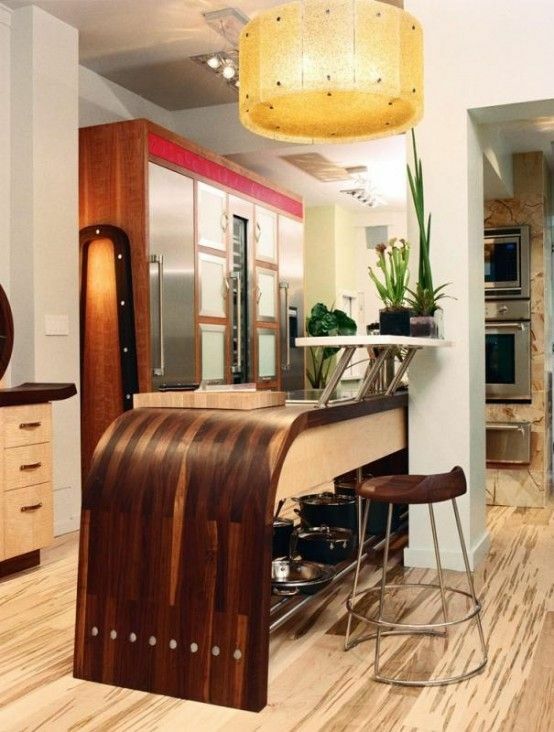 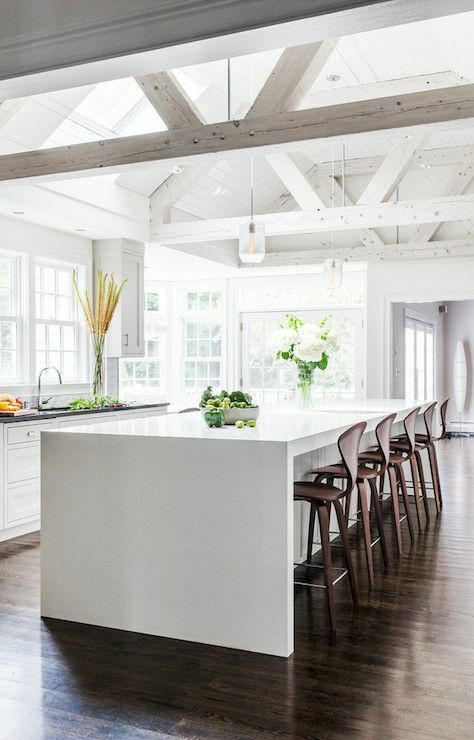 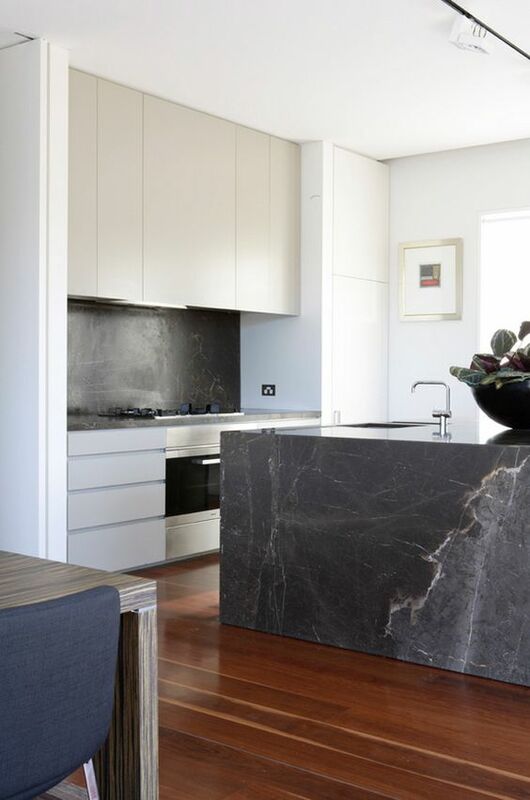 Sleek modern wooden countertops add no less modern flair than concrete or stone. 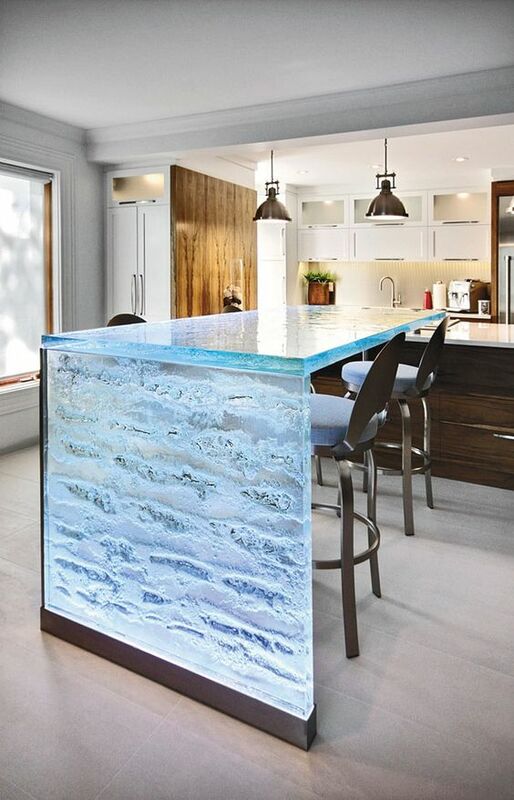 Tempered glass with unique patterns within can give the kitchen quite a unique aesthetic, though it’s not that durable, it looks amazing. 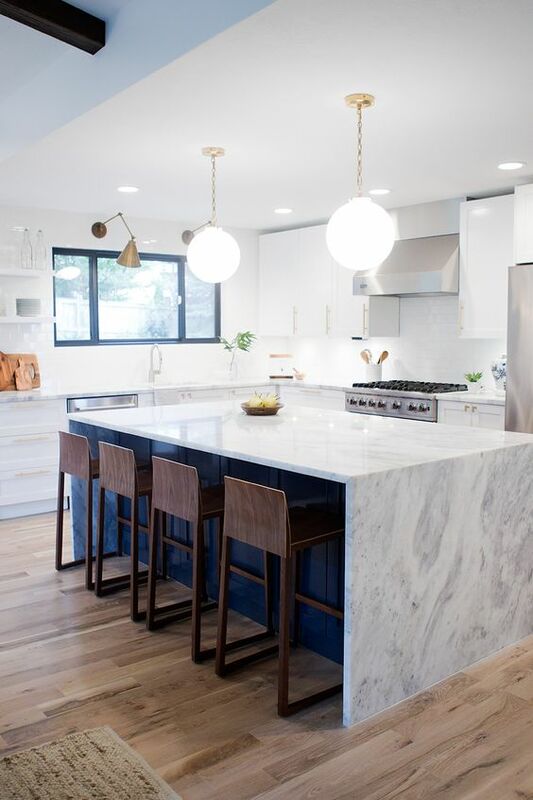 If you want something different, make a waterfall countertop to show off the intricate patterns of stone, wood and glass for maximum appeal in your kitchen.